Property had different levels to the garden taking you from the living area to a fairy tale garden. No plastering or painting needed. 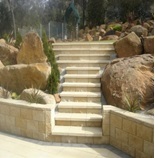 The blocks can be ordered pre-sealed with a Nano technology.Capping provides a closing edge to the walls and steps. Home owners, offices, estates and even factories make use of this product to get a sleek modern setting for their building.